"This is not the usual type of cattle rustler. He's smart and he's brave and he's a killer." 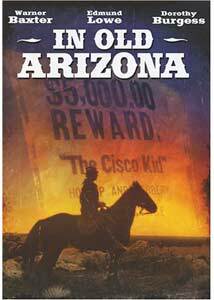 The years have not been kind to In Old Arizona, one of the first feature-length talkie westerns to come out of Hollywood after the immense buzz created by The Jazz Singer. In fact, it had originally been shot as a silent movie and later was re-filmed in part to meet the audience's demands for talking pictures. As a result, many elements play without any sound until some sound effect or dialogue is clumsily dropped onto the track. However, this tale of O. Henry's The Cisco Kid captured the moviegoers of 1929 with its tale of love and betrayal. The Cisco Kid (Warner Baxter) is a lone bandit, robbing stagecoaches and stealing cattle all for the sake of money. He's not without his charms, as evident by a scene in which he stops during a robbery to give a fair maiden some due compliments, but is deadly with a gun. Now the Army is beginning to become irritated with his hampering of federal money transactions and dispatches a squad led by Sgt. Mickey Dunn (Edmund Lowe) to detain The Kid. Additionally, a vigilante group is formed by the citizens of Arizona with the intent of killing the rascally devil. Of course there has to be a woman in all of this and Tonia Maria (Dorothy Burgess) fits the bill. She's cheating on The Cisco Kid, but is careful to keep her infidelity from him. Through a series of coincidences, Sgt. Dunn comes to realize that she is his key to collecting the bounty and sets a trap for The Kid. The conclusion is poorly handled and seemingly endorses The Cisco Kid as a hero, but I imagine that the direction by Raoul Walsh and Irving Cummings did to the audiences of its day what Michael Mann's Collateral did to ticket buyers last summer. The suspense is gone when viewing this movie from a contemporary standpoint, but if you're able to divorce yourself from the 21st century perhaps the climax will contain some air of mystery for you. While In Old Arizona is rife with problems deriving from its era in cinematic history, such as static camerawork, it still has moments of flair. Some of the scenes that are holdovers from its original silent incarnation fare pretty well and the performances are extraordinarily good, considering their context. Warner Baxter won a Best Actor Oscar for his role and, although stagy by today's standards, at least he emotes and creates a genuinely entertaining character. Edmund Lowe's performance is extremely lackluster by comparison, especially with that annoying New York accent (if I hear him say "goil" instead of "girl" one more time, why I'll...), making this definitely Baxter's show. Even if it doesn't hold up well, In Old Arizona cannot truly be judged by our standards. It was made for a different period of time period and doesn't have the thematic maturity of, say, All Quiet on the Western Front to make up for its stylistic shortcomings. It does serve, however, as a record of how far movies have advanced in the past century. Image Transfer Review: Although many scratches and print defects permeate this transfer, the image is surprisingly strong. Detail is good and contrast is much better than I would have expected considering the film's age. Any of the flaws in the image here can be traced back to the condition of the film, not the image transfer. Audio Transfer Review: There are two mono English tracks, one restored and one the historically preserved original. The restoration is a hundred times cleaner and crisper than the original, so choose that for your viewing pleasure (the audio is difficult enough to decipher as it is, thanks to poor recordings). Yet, even the restored mix has its problems and you'll need to be very attentive to make out the dialogue. However, it's nice to see that Fox elected to include the hissy, crackling soundtrack as a piece of film preservation. Extras Review: There are no supplemental materials on this set. The barebones DVD of In Old Arizona features a nice audio restoration and an overall good-looking image transfer, and film historians will be interested in picking up this set.